As a major player in the cloud infrastructure market, Microsoft is keen on figuring out better ways to store and power its machinery. To that end, it’s now deployed a data center on the seafloor off the Orkney Islands in Scotland. The idea is part of Project Natick, an initiative to identify environmentally sustainable ways of running large-scale data management units. 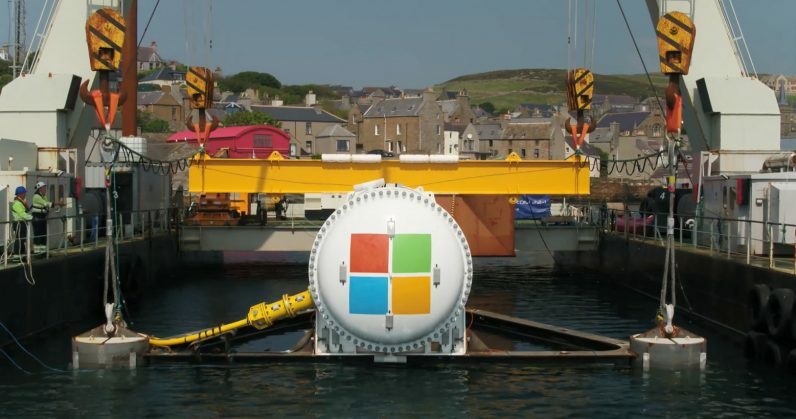 The first phase, which kicked off in 2014, saw Microsoft build a small submersible data center that housed the equivalent of 300 desktop PCs and drop it into the ocean back in February 2016 to test whether it’d actually work. That vessel operated for nearly four months. In phase two, which kicks off today, the company has fit 864 servers on 12 racks in a sealed submersible that’s about the size of a standard 40-foot-long shipping container; it’s designed to function for five years without requiring any maintenance. Why take all this effort to dunk data centers underwater? According to Microsoft, it’s about energy efficiency and fast data transfer. The company notes that roughly half of the world’s population lives within 120 miles of the shore, so being able to house servers near them could allow for quicker access to online services. Next, these can be powered by wind mills located near the water, so you’d never have to worry about outages or energy costs. Lastly, the water in the ocean is perenially cold, and can thus take care of cooling the data centers without incurring additional costs for thermal balance. This particular data center will be monitored for the next 12 months; researchers at Microsoft will keep an eye on factors like power consumption, internal humidity levels, and temperature. The company hopes that it’ll eventually perfect this system of deploying data centers that are cheaper to run for years on end. This isn’t the first time Microsoft has taken its infrastructure below sea level. Last September, it partnered with Facebook and Spanish telecom firm Telxius on the Marea Project to lay a 6,600 kilometer-long (~4,000 miles) undersea cable between the Virginia Beach in the US and Bilbao, Spain, to transmit data at a speed of up to 160 terabits per second.